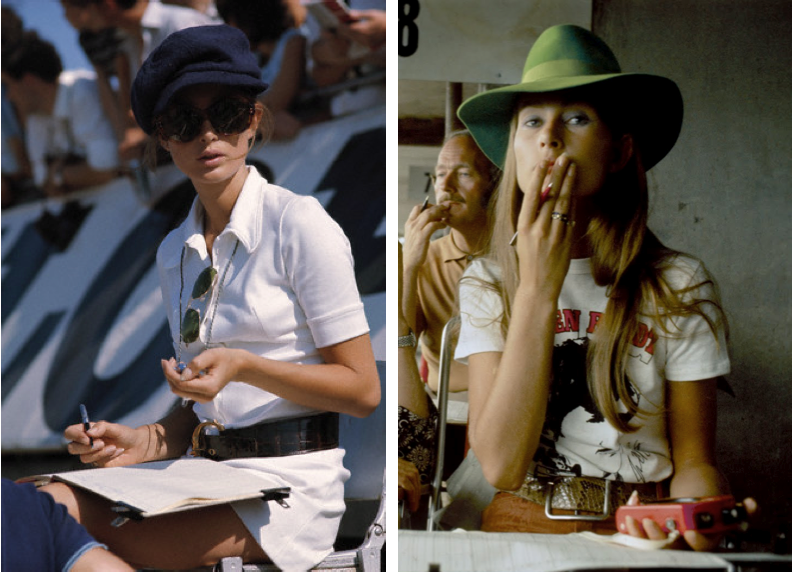 Photos of Nina Rindt, wife of Formula One Lotus-Ford team racer Jochen Rindt, keeping time in a pit stop at the Silverstone Circuit during the British Grand Prix, 1969; via Blog do Ico. The hats! Incredible! Especially the green one. Congrats on your piece in the Guardian, I completely agree, tomboy style is where it's at! Just blogged/tweeted it!! love everything about both of these outfits. my dad races, and this is her keeping track of his lap times. Nina Rindt was classy lady. Followed Formula 1 when i was in Europe in the late '60's and early '70's. Jochen and Jackie Stewart were my favorites and they were neighbors living in Switzerland. I am obsessed with those dreamy hats.